What Is The Best Treatment For Moderate – Severe Acne? Acne can affect more than just your skin. It can leave you feeling depressed, anxious, and overwhelmed. Regardless of whether you’re a teen or an adult, acne can prevent you from leading a social, active life and participating in the activities you enjoy. In the past, antibiotics and Accutane were the only effective treatments for moderate to severe acne. This is no longer the case as there is now a cutting-edge, drug-free treatment called LaserClear. Let’s take a closer look at what LaserClear is and how it can help you achieve the smooth, beautiful skin you’ve been longing for. LaserClear works by delivering gentle energy to the skin through the use of two separate state-of-the-art lasers. If you undergo a LaserClear treatment, you can expect for it to be completed in 20 to 30 minutes with minimal discomfort. Following a series of treatments spaced two to four weeks apart, you can enjoy a long-term improvement in your acne. 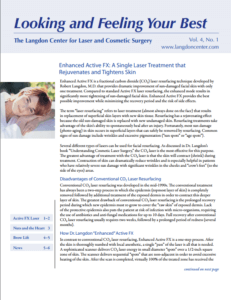 The Langdon Center is thrilled to be one of the only laser centers that has both of the lasers necessary to perform LaserClear treatments. These lasers have been used for years by Dr. Langdon and the rest of the Langdon Center team for treating age spots, hemangiomas, and other skin problems. If you are suffering from moderate to severe acne and are frustrated by topical and oral medications that offer temporary or minimal results, LaserClear can truly change your life. It can be just what you need to resolve your acne and prevent the scarring that it often leaves. There are countless acne treatments on the market. However, the two that are most likely prescribed for moderate to severe acne are oral antibiotics and Accutane. In order to be effective, oral antibiotics must be taken year after year. Because they do not achieve a cure for acne, you have to take them until you grow out of your condition. While Accutane may cure acne, it can cause birth defects and is linked to serious side effects. LaserClear does not require years of treatment or lead to serious side effects. It’s extremely safe and can provide you with long-lasting results after a series of treatments. If you’re ready to get rid of your acne for good in a safe, convenient way, we encourage you to schedule a LaserClear consultation at The Landon Center in Guilford, CT. Call us at 203-717-9592 or fill out or convenient online contact form.